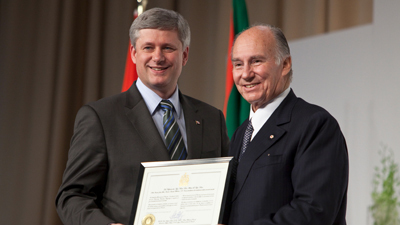 PM welcomes Aga Khan to Canada - 2010-05-28 | Ismaili.NET - Heritage F.I.E.L.D. The Museum, which is an education project of the Aga Khan Development Network, will be dedicated to the acquisition, preservation and display of artefacts relating to the intellectual, cultural, artistic and religious heritage of Muslim civilizations. It is scheduled to open in Toronto in 2013. During the visit, Canada will formally grant honourary citizenship to His Highness the Aga Khan, an initiative that was passed unanimously in the House of Commons on June 19, 2009. “Conferring honourary citizenship upon His Highness the Aga Khan is a recognition of His Highness’s leadership as a champion of international development, pluralism and tolerance around the world and of his remarkable leadership as Imam of the worldwide Ismaili community,” said the Prime Minister. The Aga Khan is the Imam of the world's 15 million Shia Ismaili Muslims. The Government of Canada has a strong, long-standing relationship with the Aga Khan Foundation Canada (AKFC) that spans more than 25 years. AKFC is a trusted partner of Canada on a wide range of international development projects, including in Afghanistan, in the areas of health, education, rural and economic development, and the creation of new opportunities for women.